NOW SHIPPING !!!! ORDER SOME TODAY !!! To our knowledge, we are the only company currently making a windshield for this machine! Cold weather is on the way! 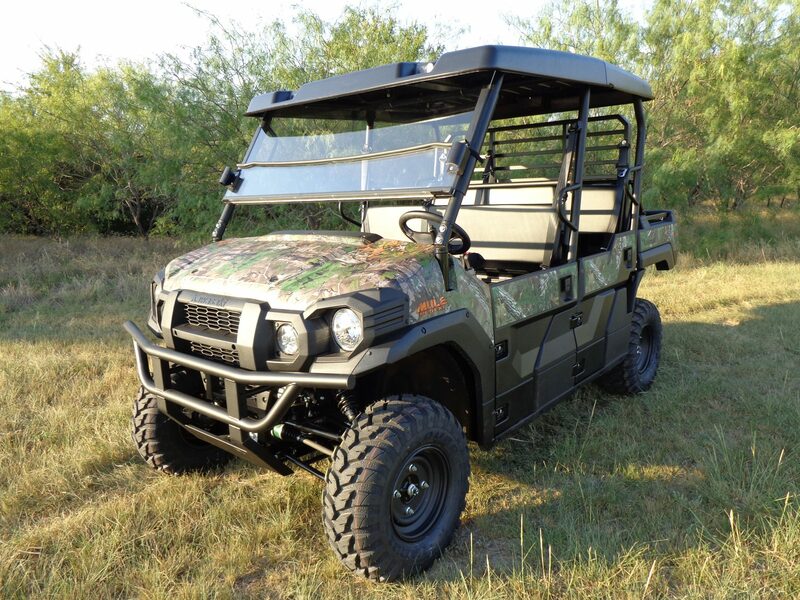 Why should your Mule Pro FXT customers need to be cold while riding? We have your answer! The Mule Pro FXT has only been available for a few short weeks now, and we already have our new split windshield designed for it! Many DEALERS have yet to even receive a new Mule PRO as of yet. We already have our unit and have products designed for it! 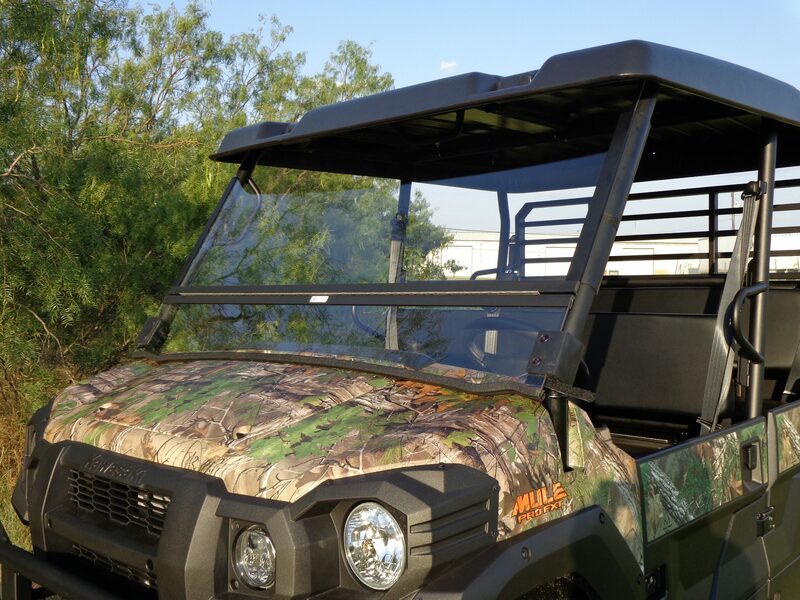 The world’s first ‘split’ windshield for the all-new Mule PRO FXT! The factory only offers a full windshield (fixed in place) or a half windshield. 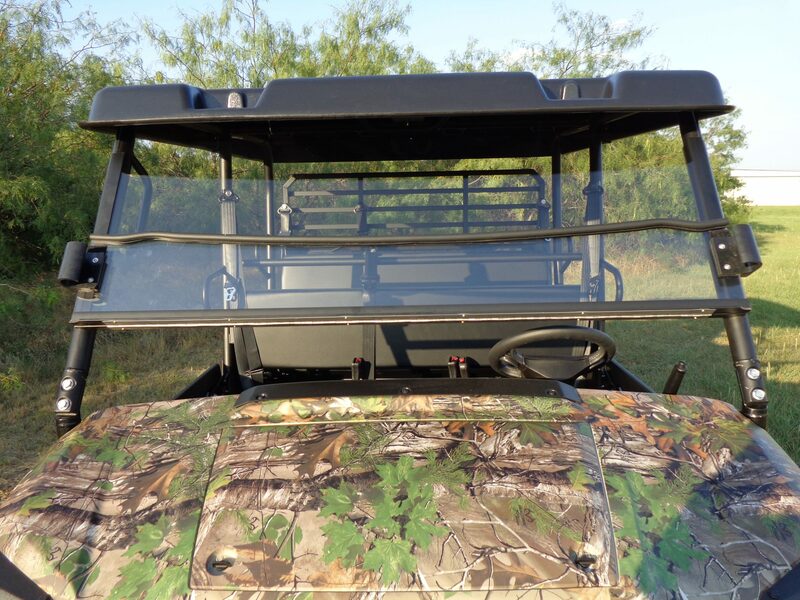 The GR Manufacturing windshield is the best of both worlds: close it down on cool days or in the Winter, and open it up in the warmer months! Opens simple and fast, with NO tools required! Fast installation, with NO tools required. Proprietary attachment methods and fast attaching clamps are used during our assembly. Installs in 30-seconds, right out of the box. Need to tow your new Mule PRO? Sure you do. You’ve got to get it home from the dealership, and to all the fun places you will ride. But guess what? The factory windshields are NOT recommended for towing on an open trailer! What? Yes, read the fine print in the factory windshield description before you buy that version. The factory says “it is recommended to to the vehicle in an enclosed trailer”. This machine is huge. An enclosed trailer that it will fit in, would cost a small fortune! 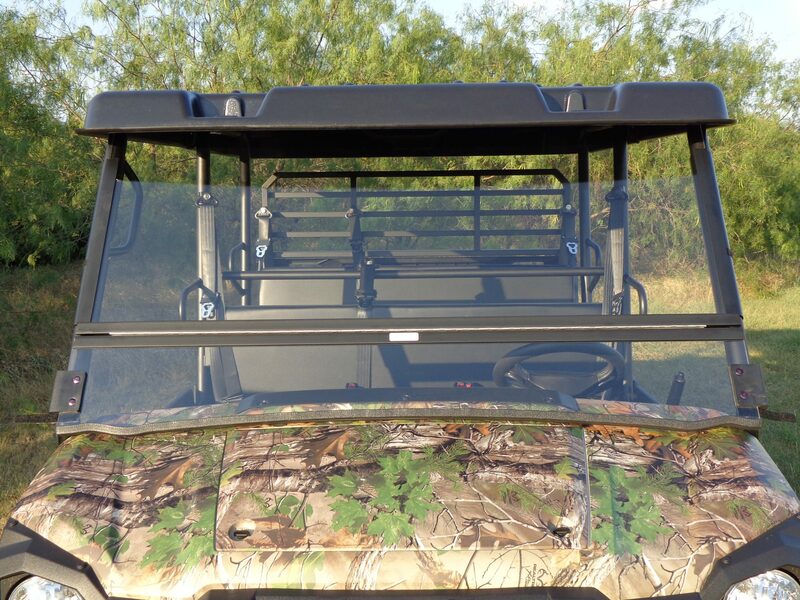 You CAN tow your Mule PRO on an open trailer with our windshield design. We have tested the unit on a trailer at normal highway speeds. Just be certain you trailer the Mule in the forward facing position and no worries. 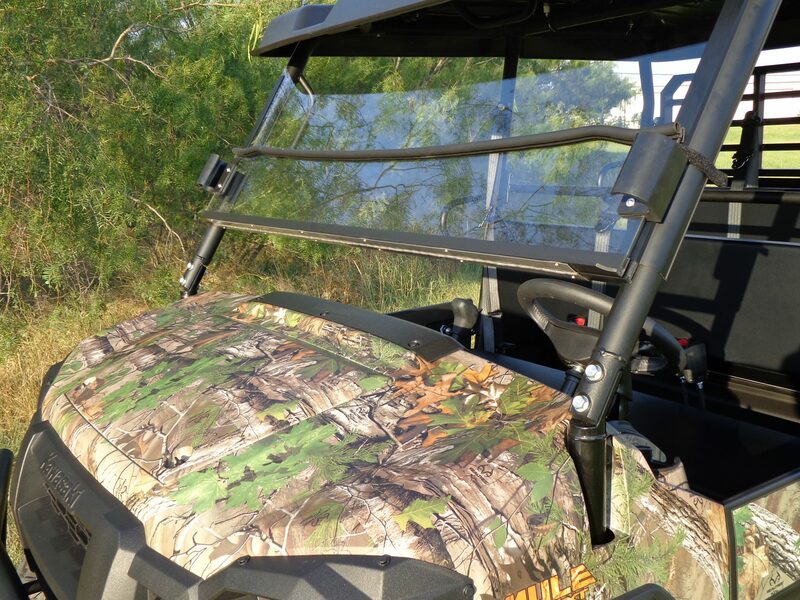 The materials and design properties of this new windshield is exactly like our other Mule windshield designs. Counting the Mule 600/610, the Trans Mules, the 3000 and 4000 series Mules, and the Teryx machines, we have over 7,000 of our windshields in service across the globe. THIS IS A HIGHLY proven design, so contact your local Kawasaki dealer, specify you’d like information on a GR Manufacturing windshield, and buy with confidence! Works flawlessly with the factory plastic hard top….but then again, you may wish to look at our new top for this machine too! Once again, the factory themselves do NOT recommend towing your brand-new Mule PRO FXT on an open trailer when using the factory top. Insanity, in our opinion! You CAN tow your new machine with our top and/or windshield. NOW shipping to Kawasaki dealers !